I love Queen Sugar. Let’s start there. I’d take Queen Sugar on a $200 date, juju on the beat with it, and cook greens, beans, tomatoes and potatoes just so it would have something to take home in case it got hungry. For those who aren’t familiar, the Ava DuVernay-helmed show is the story of a Louisiana agricultural family—the Bordelons—dealing with the fallout after the death of the family patriarch, and it’s one we haven’t seen on television yet. At all. But Nova, Charley and Ralph Angel are all family to me. The writing is good. The acting is good. The directing is awesome sauce. And on occasion, the show hits you right in the feels. Full disclosure, since I became a father in 2009, nearly all depictions that are father-related—especially those where you see a dad trying his best—get me. I’m talking, my whole atmosphere is an allergen at times. I watch movies differently since I’ve become a dad. I see commercials differently. When I’m out and I see a little girl holding her dad’s hand, I unintentionally smile as she looks at him like a hero. She has no idea what struggles he’s facing; she just knows that dad is a hero. Stuff like that gets me. All. The. Time. My thug has been disposed of and replaced with a heart. I think kids do expose you to a different side of who you are—the better side. Even the roughest dude usually has a very, very soft spot for his children. I’m no different. Ralph Angel (played by Kofi Siriboe) is the father of a little boy named Blue (Ethan Hutchinson). Since getting out of jail, Ralph Angel, for all his faults, has made sure to make his son the center of his universe. He provides for him the best he can and does all for him, including some temporary lapses in judgment. Thank God for Aunt Vi (Tina Lifford). Ralph Angel has pent-up anger at Blue’s mother for being unable to care for her own son while he was down because she chose drugs over her child, and now even she is trying. Point is, Ralph Angel is a father who wants nothing more than to be a great father to his son. There’s just one problem: When he went to jail, guardianship of his son went to his aunt, Vi, who is not ready to give Ralph Angel that responsibility back. Ralph Angel has both implicitly and directly asked Aunt Vi to allow him to regain his legal guardianship of his son. It’s a running theme through the show, but it hit home especially hard in episode 10. Blue’s class is preparing to take a trip to the zoo. Ralph Angel signs a permission slip so that he can go. The next day, the teacher asks Ralph Angel to stop by so that she can talk to him. She informs Ralph Angel that because he is not Blue’s legal guardian, the school needs Aunt Vi to sign the slip. Ralph Angel retorts that he is Blue’s father; but legally, that’s irrelevant. I don’t even have that problem in life, but again, seeing this dad, who is trying, realize that he can’t even grant permission for his son to go to the zoo hit me where it hurts. I felt for him. I wanted to hug him. In this same episode, Aunt Vi points out to Charley (Dawn-Lyen Gardner) that her soon-to-be ex-husband has a right to know what’s going on in his son’s life despite how horrible a person he is because everybody deserves a second chance. This resonates with Ralph Angel because despite the best efforts of mice and men, Aunt Vi doesn’t think that he, who is actively working and providing for Blue, is ready to be the guardian of his own son. This sets up a scene where Ralph Angel asks Vi to sign the permission slip, which she gladly does, remarking how much Blue loves animals. Ralph Angel almost walks away but decides that he needs to let Aunt Vi know how it feels; that even though he’s not in jail and has paid his debt to society, he’s still not free. He does everything he is supposed to do but doesn’t have the right to do something as simple as allow his son to go on a class trip to the zoo; a decision so small looms so large over his heart and mind. All he wants is to be a parent. And with tears in his eyes, he’s begging for his second chance, some mercy and a signature on a piece of paper that holds so much weight over his life. He pleads his case, and Aunt Vi balks initially, largely because she can’t stand Blue’s mama, who has come back into the picture, but she is also going through growth and realization in her life and realizes that it’s time to let the reins go, while still offering to be a source of help and support, because it’s OK to ask for help if you need it. Their powerful embrace almost did me in. It wasn’t a hug of thanks, but of relief. It was Aunt Vi seeing him not for his mistakes but for who he is trying his best to be and what he wants to be for his son. That entire scene illustrated why I love this show so much. It was real. It was acted well, but the sentiment was real. The struggle was present and not unfamiliar to many of us in our community. Something as small as a trip to the zoo emotionally triggered the struggle this man faces daily in attempts to get out from under the thumb of the system. Scenes like that, with the smallest attention to detail, are why Queen Sugar is such a good show. The writing and directing are phenomenal, the cinematography is awesome. And the cast pulls it off. 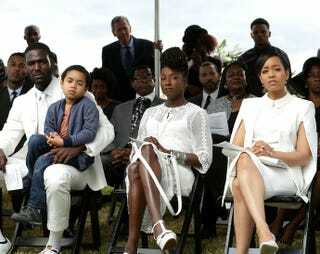 This particular struggle is Ralph Angel’s, but Nova (Rutina Wesley) and Charley are fighting battles and facing demons all the same while the family tries to keep up the good fight. Queen Sugar tells a million stories, and one of them is probably yours. If you’re not watching Queen Sugar, you should be. If you are watching Queen Sugar, I’m right there with you.